I've driven by this hayfield hundreds of times but hadn't stopped to photograph here until two weeks ago. 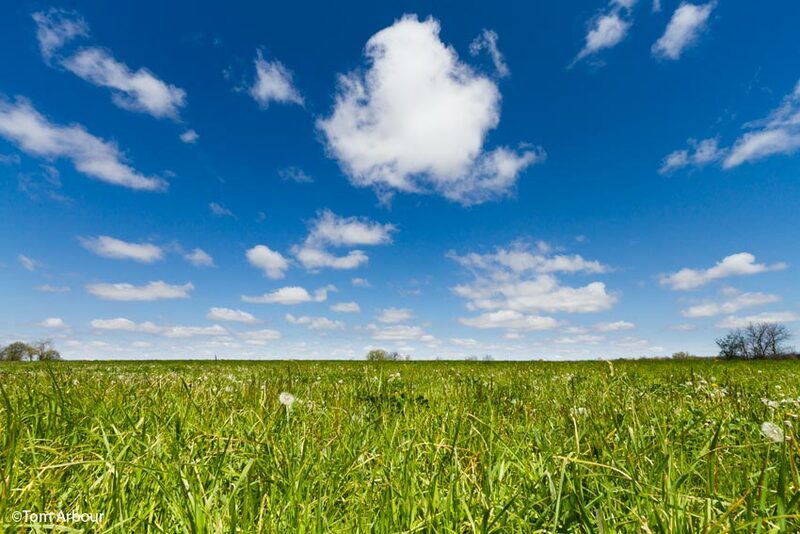 A perfect cumulus-filled sky hung above this grassy expanse, which is frequented by American Kestrels and Eastern Meadowlarks. When I'm driving, I'm always thinking about what my next photo stop might be. I knew this hayfield was interesting, but it wasn't until this day, when the clouds were perfect, that this field made an interesting subject. Speaking of interesting subjects- would you like to learn more about photographing nature with myself and professional photographer Barb Schwartz? We're leading a two-hour class at Inniswood Metropark near Columbus where we'll help you learn how to use your DSLR to get great photographs of flowers and foliage. Go here for more information- I hope to meet you on Saturday May 25.